STEPHEN ALLISON: Prince Harry at risk of arrest by Europol? I have blogged a few times about Europol and the EU Arrest Warrant but these seem to be subjects that no-one is concerned about other than the dwindling band of people in this country who actually care about civil liberties and the supremacy of British Law on the (formerly) sovereign soil of this our green and pleasant land. Heathrow airport is most certainly not green and pleasant but it is definitely part of Great Britain, unfortunately just how far the supremacy of British law has been eroded was shown this week when a German born man, now with Australian citizenship, was detained by British police the moment he landed in the UK even though he has not committed any crimes in either the UK or Australia. So how can someone be arrested for a crime that does not exist in either of these countries. Simple, the police extradition unit pounced, using an EU arrest warrant issued by German authorities. The arrested man will now be sent to Germany to face trial. This of coursed is exactly what the European Union claimed would never happen. Europol however have been very careful in choosing their victim. The man in question is one of a small band who claim that the Nazi Death Camps were just anti German propaganda made up after the end of World War II. As such there is quite rightly very little sympathy for him anywhere outside his own small group. The worst that could happen to anyone who denies the holocaust in this country (or Australia) is they will be called a prat, or much worse, but it is not a crime. If they are quite happy for no one to like them very much, apart from a few other loonies, then there is nothing to stop them from denying the holocaust. However, in Germany it is a crime, punishable with a prison sentence. That is German law and German business. Now, thanks to the European Arrest Warrant it is also an arrestable offence in the UK even though our Parliament has never passed any legislation specifically dealing with this issue. So, the newspapers and the authorities are mostly silent. Anyone raising it of course can be accused of supporting the twisted views of the man in question so no-one dares speak out. The phrase ``I disapprove of what you say, but I will defend to the death your right to say it'' (Widely but falsely attributed to Voltaire) is one that too many people appear to have forgotten in the UK and which has been trampled on many times by the current administration’s contempt for liberalism and freedoms. The most notable case being their legislation to surround Westminster in a half-mile no protest zone. This was mainly aimed at removing a long running anti-war protest from Parliament Square but has significantly reduced our freedoms to protest about our ruler’s decisions. I have this poem printed out by my computer because it is extremely powerful and moving, it also can be updated to almost any circumstance where people remain silent in the face of assaults on dwindling civil liberties. The Europol have now established their rights to come into the UK and arrest a man for something that is not a crime in the UK and no-one spoke out because we accept the holocaust did happen and anyone who denies it is a prat. Who will the Europol come for next? Will anyone speak out then? 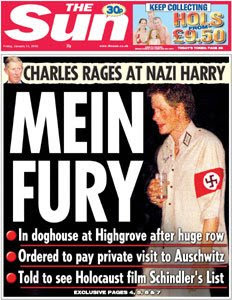 and of course Prince Harry has donned such a Uniform for a fancy dress party and pictures have appeared in National Newspapers. Can we expect Europol to be swooping on the Palace of Westminster and Windsor Castle anytime soon?